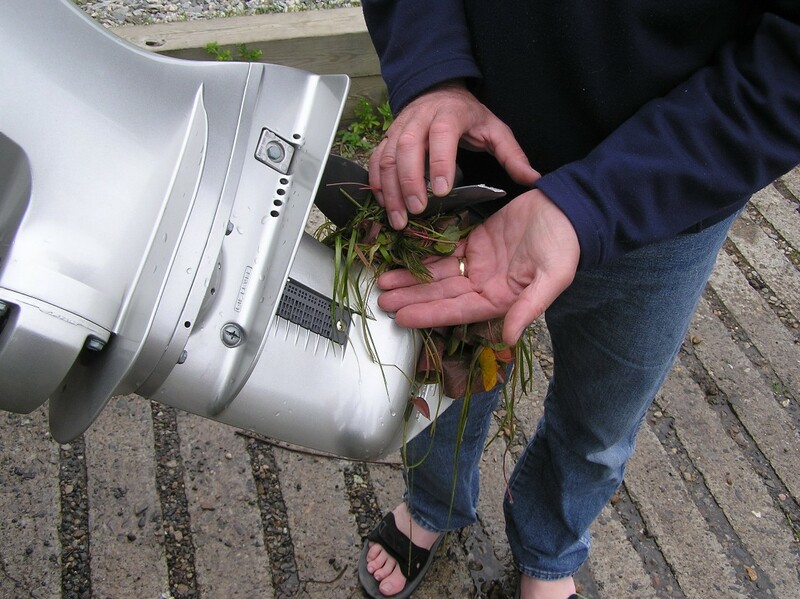 Boating and angling represent known pathways for the introduction and spread of numerous aquatic invasive species (AIS). Lake Champlain’s most infamous AIS, the zebra mussel, likely arrived in this fashion. 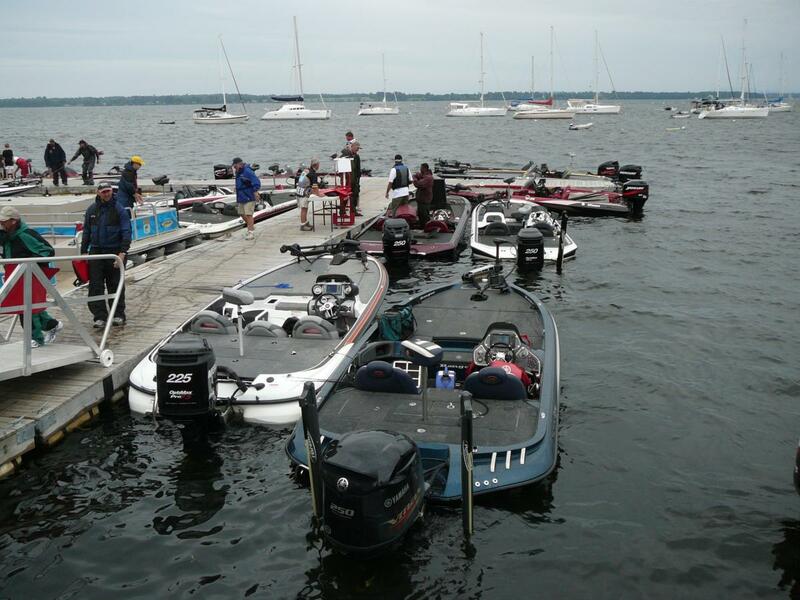 Each year hundreds of bass tournament anglers at the club, state, regional or national level bring their boats to Lake Champlain to compete for recognition and cash prizes. Since 2009, LCSG staff, with support from a graduate assistant, have visited numerous bass fishing tournament registration or weigh-in sites in Plattsburgh, Ticonderoga and Colchester to conduct AIS spread prevention outreach. Over 2,000 competitive anglers have received information about AIS threats, including those currently posing challenges to the lake’s ecosystem as well as those yet to become established in the Lake Champlain Basin. Like many outreach efforts, the trainings and interactions have become a “two-way street.” SG staff listen to the concerns of tournament organizers and anglers, while simultaneously advocating for known “inspect, remove, drain and dry” boat and gear management practices. This interaction with the industry (and Great Lakes Sea Grant programs) has recently led to the development and funding of a National Sea Grant Office (NSGO) funded project to adapt and extend known AIS management techniques to fishing tournament operators throughout the Northeast and Great Lakes region. The work is designed to address recent unpublished research and anecdotal information that suggests that fishing tournaments may serve to exacerbate the transport/colonization risk posed by zooplankton and disease organisms. The project is titled Fishing Tournament Organizers and Professional Anglers: Preventing the Spread of AIS by Extending AIS-HACCP and the Stop Aquatic Hitchhikers Campaign in the Great Lakes, and will run through 2012. Most public information campaigns related to preventing the spread of AIS have been directed toward recreational boaters. This project is training professional anglers and tournament organizers in preventing the spread of AIS and has produced brochures and booklets to help anglers become part of a broader citizen AIS monitoring network. It is being lead by Wisconsin Sea Grant staff with contributions from all of the states boarding the Great Lakes and Lake Champlain. Concurrent with the NSGO project, LCSG staff are partnering with SUNY Plattsburgh faculty member Dr. Curt Gervich to uncover what might impact tournament anglers' ability to utilize “inspect, remove, drain and dry” practices. The research results will be shared with tournament organizers (both local and distantly based) and may lead to the development of incentives on the part of tournament organizers to increase AIS spread prevention activities among tournament anglers. The project is entitled. Funding was provided from the New England Interstate Water Pollution Control Commission (NEIWPCC), via the Lake Champlain Basin Program. In 2005, a new fish disease known as Viral Hemorrhagic Septicemia (VHS) was discovered in Lake Ontario, after a fish kill involving thousands of freshwater drum, round goby, and muskies. Containing the spread of this deadly fish virus and preventing it from entering Vermont required restrictions on the movement of live fish and water, including fish and eggs (i.e. Lake Ontario origin steelhead) routinely moved across state lines by state fish culture staff during normal fish culture operations. 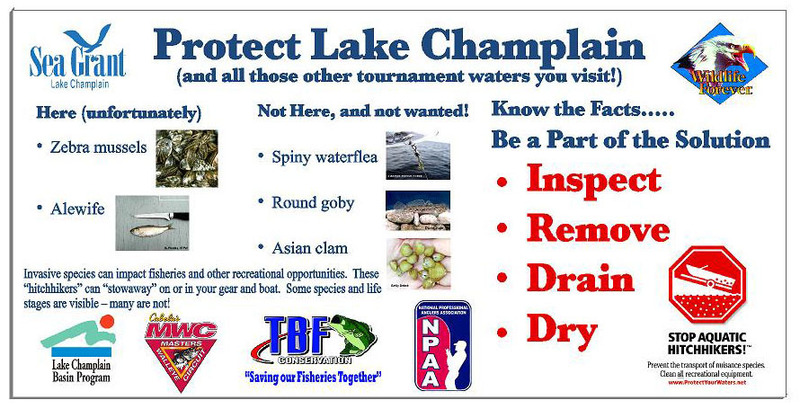 In 2008-2010, Lake Champlain Sea Grant partnered with Pennsylvania and New York Sea Grant programs to disseminate the latest available VHS information (including NYSG funded research) to both private and state fish culture operators in Vermont and eastern New York. It provided significant new information on VHS and its potential management implications. Cutting edge information on an emerging disease is especially valuable in making management decisions. Often this type of information takes years to get out and by that time the information does get out it may be too late to be useful. Workshops on new disease issues and other emerging environmental issues allow more proactive management actions with the best available information. The information about egg disinfection lead us not to delay the decision to move the walleye program to our Ed Weed hatchery. We had already made the decision to have the Ed Weed Hatchery stock only Lake Champlain, but it's information like that provided at the workshop which reinforces those decisions. Vermont Fish and Wildlife staff continue to separate Lake Champlain operations from other Vermont fish culture operations based in part on Sea Grant funded research and extension efforts.